The following report is an abridged version of "Ears Eyes Nostrils Open!" to be presented today at the Conference Echo Red: Military Archaeologies and Architectural Trajectories. The soundscape of Guam has undergone a profound sonic metamorphosis. Listening today, we hear the sounds of visitors and commuters on the busy roads, a general bustle of development which continues to amass at the edges of the former base. By contrast, the interior of the base once full of deafening military noise is now devoid of the sounds of machines. We have instead an abundantly rich soundscape of bird calls: CHIT TAT SEEWWOP SEEEUWOP TAT TAT; the rustling canopy of the emergent rainforest: FRRRRRRRRRRSHHHUHH KASHHHHH KITK KUTK HHHHHHHSSSSSHHH; and hollowed landforms in which gusts of wind produce low resonances, recalling jets returning from a sortie over the Philippine Sea: OOOOOOOOWWOWN OOOOOOOOOWWWWWERR WWWWERRRRRRRRRRR. This is the material I work with (and sound is a physical material). This work of archiving is a form of archaeology, as I cannot travel into the past to record what the base once sounded like. As an archivist, it is my privilege to be selective of the present. There is a great power in the act of archiving; I am selecting which histories will be retained and which will be ignored. My recordings produce both the histories of and the futures for the island. The most profound experience on Guam is to walk from the former edge of the base into the interior. From the outside your ears will be full of the sound of tires on the road or Filipunk music emanating from a nearby Guahan household. Walk through the foliage which grows on the berm and rise up where the tinny chatter of people in the villages and the machines on the road condense into a mist of white noise. The trees increasingly filter the signals, adding to it the white noise of their own leaves in the wind. Walk through a fracture in the ground which has been carefully managed by the Park Service to permit you to penetrate the jet noise barrier. As you wind through the opening, the sound of your footsteps bouncing quickly back to your ears, a vista opens through the gaping mouth of the jet noise barrier. The atmosphere is distinctly different because the jet noise barrier has now switched orientations, blocking not jets but the background rush of the every-day landscape. Exotic bird calls cutting through the still air to your cochlea signify this brave new world. As I archive these sounds I am simultaneously seeking to preserve them. What does it mean to preserve the sounds we hear in a landscape? The synthesis of sound and landscape is a soundscape, a term coined by the Canadian composer R. Murray Schafer. According to Schafer, a soundscape consists of keynote sounds, signals, and soundmarks. Keynote sounds refers to background sounds, signals to foreground sounds, and ‘soundmark’ refers to “a community sound which is unique or possesses qualities which make it specially regarded or noticed by people in that community.” 1 While the keynote sounds and signals can be uniquely identified in a sound recording, the soundmark requires some relationship to a physical landscape. A sound is not merely an emission from a source; it is a composite of environmental absorptions and reflections of the source’s sound. This unique imprint defines a soundmark and therefore embodies that which a sonic archivist seeks to preserve. The central character, Halloway, dissatisfied with what he sees as the dulling of the imagination in Garden City, with its organic conformity, makes his way back to the abandoned New York, where he attempts to restart the metropolis and its power supplies. Significantly, it is the noise of the city that he misses and that he is inescapably drawn to....This time, the story anticipates the Positive Soundscapes research project...[which aims to]convince architects and town planners to think beyond the traditional focus on reducing noise levels and to pay attention instead to the many possibilities for creating positive environments in the soundscapes in which we live. The archivist, then, has a distinct role in reshaping our perception of the sonic environment. The archive ceases to be about recording the past, and instead, through its specific categorization and re-presenting of recorded sound, it projects possible futures into the world. To archive and therefore preserve sound, the act of recording is not enough. Sound recordings are limited by a single listener’s perception of the soundscape, tracked over a linear stretch of time. Furthermore, recording is conditioned both by the technology which records and the technology of playback. To archive a sound is to consider the future means for listening before the act of recording takes place. Sonic archiving, therefore, is a practice which spans between the real and the virtual. One must first listen and identify the soundmark in real space. Next one conditions the act of listening by introducing a mediating apparatus, usually some kind of microphone. Here the real recedes into the virtual. The critical act in sonic archiving, however, is the means of playback. The virtual now reaches out into the real and reproduces the soundmark of the original place. The parameters are manifold: in what space, through which transducers, in what kind of atmosphere, time, and season will this recorded sound reproduce the original? The ‘aura' of the original is diminished by the technologies of recording and amplifying. When we record sound, we must consider that the recording is an altered state; the process of ruination has already set in. To be specific about what I mean by 'ruination', it is necessary to qualify the difference between sound and noise. What I would like to trace are three divergent attitudes of environmental noise: to celebrate, to eliminate, and to refine noise. These attitudes carry different definitions of 'noise' as a subset of 'sound'. In addition, noise is not possible to define without talking about signal. The military is especially concerned with signal-to-noise ratios, thus linking together military communications personnel with hi-fi fanatics. Jet sound is awesome, in the deepest sense of the word. It is inevitable that jet sound leaves a residue because the hollow form of the jet noise barrier is capable of reproducing the lowest frequencies that we find manifest in jet sound. It gave birth to this structure which, now through its hollow tubes, can be tuned to produce resonances similar in frequency to the most powerful and pervasive jet sounds. Let us dwell on the final phrase “ears eyes nostrils open!” Sound is also smell as sight is also taste; the coupling of sensory organs is a physiological phenomenon called synesthesia. 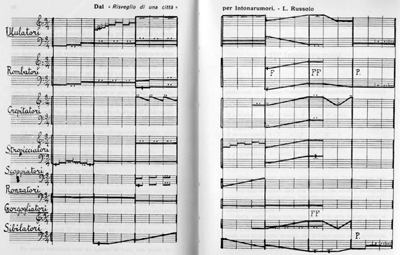 The sounds of war, Marinetti exclaims, force a merging of all of these senses into a profoundly loud, total experience. Another worshipper of noise emerged in Italy in the years preceding WWI. His name was Luigi Russolo, and he famously introduced his noise-machines into the concert hall to hissing and booing audiences (themselves unwitting corroborators in a total noise orchestra?). Russolo was at the foundation of a cultural shift that would lead into the Dada movement and later into the work of John Cage and musique concrète in the middle of the 20th century. While the media and means of propagation would change, the project of celebrating noise has always retained the agenda of producing an oblique awareness of our surroundings; where music and pure signal condition us in deterministic ways, noise permits a free-willed, even absurd pattern of existence. Ultimately the value of noise is to produce an awareness of this "boundless" quality of space. Through an appreciation of noise we might lift ourselves from the tenacious hold of visual culture on archival production. The will to celebrate noise treats sound as a material with physical force, valued not for what it represents but for what it does. Few on Guam, aside from the rumored jet sound cult that purportedly meets in the abandoned Navy Signals Division, would wish the jet sound to return. In fact, now that they have a taste of a soundscape free of military sounds, activist groups are organizing to produce more silence. The next big target is the civilian airport, and it’s unclear just where these silence-seekers will stop. We must ask what is the value of a landscape devoid of the sounds which make it unique? This phenomenon is not by any means limited to Guam. There are ongoing movements traced back to early 20th century New York City which argue for the production of silent zones and the mitigation of environmental noise. The city which invented density also invented the decibel. Trucks would patrol the city and measure the amount of noise in relative terms, turning New Yorkers onto the detrimental effects of their noisy city. 5 A century later, International Noise Awareness Day, April 28, would be marked by the Center for Hearing and Communication offering free hearing tests from a roving truck. Amy Boyle, Director of Public Education at the Center for the Hard of Hearing said "It is time that we take responsibility to quiet our surroundings and create a healthy environment for us and our children." 6 Noise ceases to be associated as a sonic phenomenon and is instead equated with the unwanted scourges of the city such as fire, smoke, and smog. While these sanctuaries of silence are valuable resources and ought to be fought for, they threaten to become hegemonies of silence. In order to produce zones in the "absence of human-caused sound" the soundmark of adjacent soundscapes could be adversely affected. While the military went through great pains to produce a barrier that would suppress noise, it is widely believed to have failed in this regard. In Fig. 6-5, the source of jet sound is pinpointed at the moment that an F-35 jet switches on the engines, at the beginning of the runway. This map is based upon a single-event measurement of 135.5 dB at 30 m distance. 9 The military also considered the flight paths and A-weighted dB readings of a general pattern of use in order to place the jet noise barrier and size it properly. 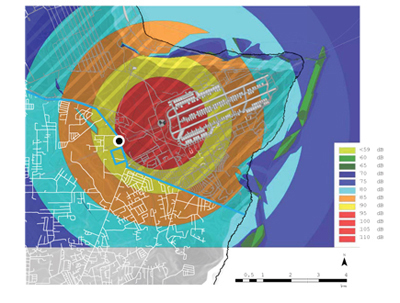 According to studies produced with assistance from Charles M Salter Assoc., residents living at a distance greater than 400 meters from the barrier would still experience a nearly identical volume if the jet noise barrier wasn't even there. If the barrier failed to perform in this way, what could it be said to have accomplished? I posit that the jet noise barrier functioned as deception. 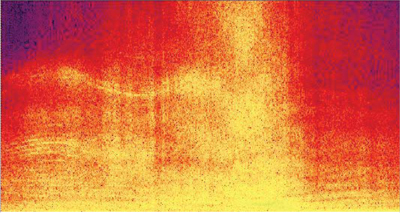 To refine noise is certainly an act of deception. Noise refinement is making signals out of the background. We have a military precedent, as it is widely known in military academies from the Chinese scholar Sun Tzu that war is deception. During WWII, the 3132 Signal Service Company Special was formed to produce the effect of a large army. The sounds of an army moving, training, etc.——what might be called noise in another context——constitutes in this case a refinement, when mixed in a certain way, which projects a false signal to the enemy. As an exercise in sonic deception, I produced some jet sound music scores which feed into a small music box. [See Fig. 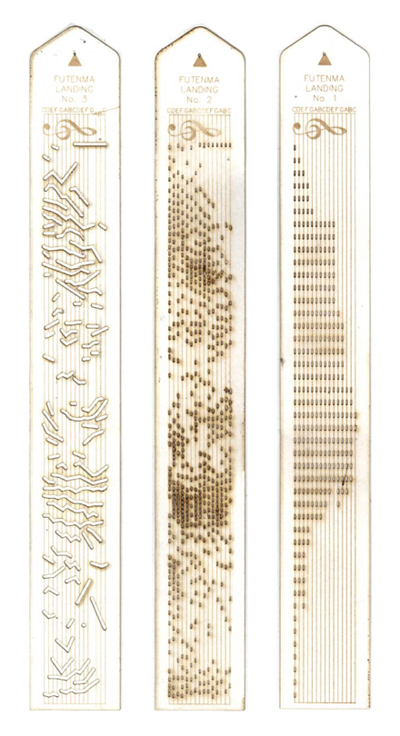 6-7] These were produced by refining noise into signals with the aid of computer scripting tools. The music box through its nostalgic and thin timbres mask the harsh, full spectrum of the jet sound. Jet sound——grouped with noise in general——has the distinct quality of being able to mask other sounds within the signal. The music box loses that quality of noise by being limited to 13 clear tones. However, depending on the refinement mechanism, certain signals within the noise spectrum may be amplified. 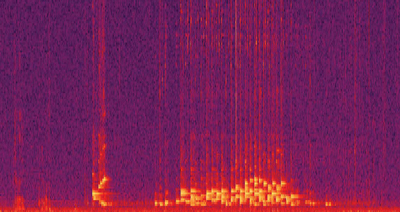 The refinement of noise entails more than amplifying certain frequency bands or signals; it requires a deliberate act of deception, such as moving a sound from its source or editing what is not to be heard. What is the soundmark of Echo Red? It is clear that jet sound defined this landscape for such a prolonged period that its mark should remain in the landscape. An era prior to the noise of military machines predates World War II. The Navy inadvertently became the first sonic archivist on Guam. In the 1960s, Polish trawlers were spying on the airspace around Guam to observe the activity of B-52s en route to napalm-bombing runs in Vietnam. In order to jam the signals of these trawlers, the US Navy recorded the sounds of native birds to run as noise cancellation, playing the bird sounds out of phase with the actual sound of the planes. When the Cold War ended, the Navy listening post and the land at Ritidian Point became a Federal Wildlife Preserve, and the sound recordings were donated to the FWP’s visitor center. The remarkable thing is that some of these birds are extinct and/or can't be found in the wild. In this effort, unwittingly, the Navy preserved the soundscape of a jungle that can never be reproduced. This soundscape can live as a virtual jungle, intersecting with the sounds of the real jungle as one moves from the artificial spaces of the visitor center to the actual spaces of Echo Red. As the jet noise barrier grew and birds became established (refer to the ornithologist's report), the military continued their manipulation of bird sound by emulating the practices of Swiftlet farmers in Malaysia. These farmers would record the sounds of the Swiftlet birds and play them in vacant buildings. Swiftlet birds would be attracted by the sounds and enter the buildings in order to mate and build a nest. The nests would then be harvested. The military, however, instead of harvesting nests, played Swiftlet sounds on loudspeakers and so amplified the habitat within the barrier. 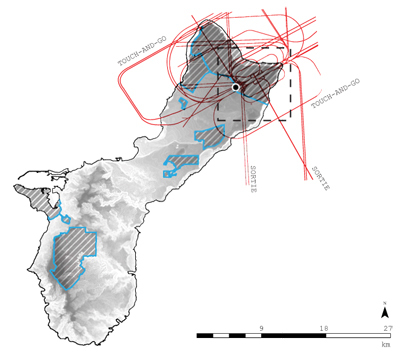 Whenever islanders grew weary of the military presence and demanded back their land, the military would furnish ecological reports showing how they are protecting large numbers of endangered species which thrive within the jet noise barrier. This is how the military survived as long as it did: the artificial bolstering of a bird habitat on the edge of the base, augmented by sonic deception. A sonic archive should provide the most honest recording of a place; what, then, of a soundmark which is marked by deception? 4 McLuhan, Marshall. The Medium is the Massage: an inventory of effects. 6 "Hear for the Future" chchearing.org. Center for Hearing and Communication, 28 Apr. 2010. 9 I consulted the software "SEL CALC" for jet sound data. 11 Stiers, Raymond. Personal Interview.